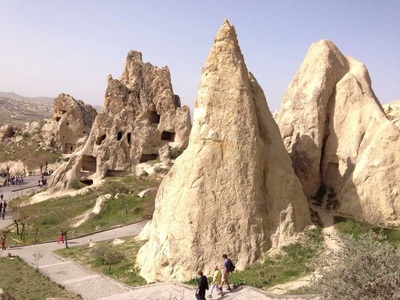 Goreme Open Air Museum is the miraculous and amazing small cave city that located at Cappadocia’s famous Goreme Valley. This small cave city was built by early Christians in 11th century to protect their faith and life style within this mystic place. As being notable for historic cave churches, the museum has a very deep and rich history. Christians escaping from the oppressions, persecutions and cruelty in between 4th and 13th centuries (also popularly known as Dark Era) settled down here. They found this unbelievable space to freely worship and protect themselves from any attacks. 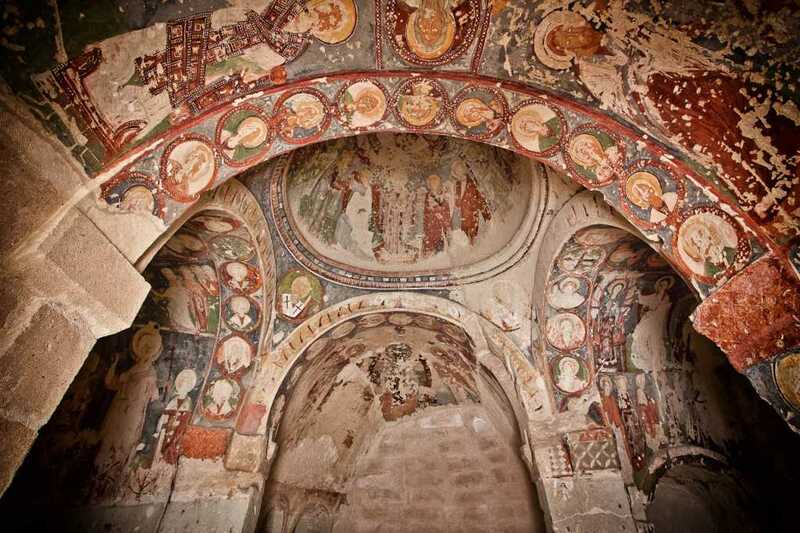 In addition to this, after the building, this breath-taking region was used as a religion education and central of the notion in 4th century by Saint Basil who was the bishop of Kayseri and significant person in history of Christianity. In those times, the thoughts or world views of Saint Basil, pioneer of the many renovations in the field of Christianity were taught here. 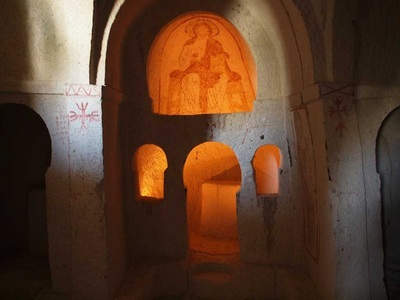 Because of that, the monastery life style in museum, a sanctuary area longs for more than 1000 years. 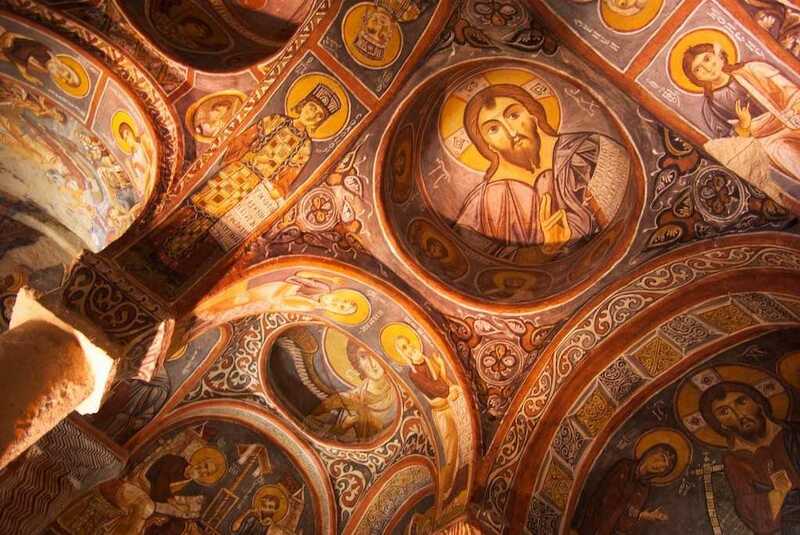 Moreover, the special museum looks like a huge monastic complex consisted of numerous monasteries situated side by side, each with its own fantastic church. It contains churches, chapels, refectories, kitchens and living places. Surrogated by Buckle (Tokalı) Church, Nunnery and Monastery, Chapel of St. Basil, Elmalı (Apple) Church, Chapel of St. Barbara, Yılanlı (Snake) Church, Dark Church, Çarıklı Church, the rich museum has been a member of UNESCO World Heritage Museum List since 1984. It was built for the sake of St. Basil. There is a graveyard belonging to the important person in the narthex section of the chapel. Those tombs were surrogated by private holes to create a mystic atmosphere by putting into various sweet perfumes here. Located behind of Elmalı church, this construction with two columns and cruciform plan is famous for amazing motifs. Its walls were covered with the different figures painted also red rock like mythological animals, geometrical patterns and military symbols. Additionally, the interesting church dates back to the second half of 11th century. Its takes the name of snake from Saint George fresco fighting a green dragon or snake painted in its ceiling. 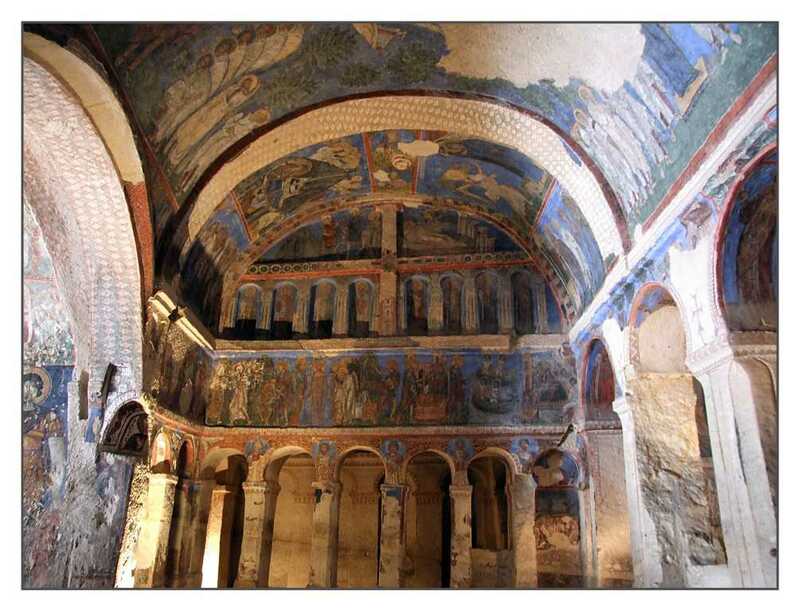 There is also found several frescoes reflecting 11th century. But most interesting figure is St. Onuphrius portrayed as half woman and half man. This wonderful masterpiece grabs the visitors due to both its unique architecture and fascinating decorations. It contains a ceiling supported with four columns and 9 domes covered by various ornaments. Its name ''Apple'' comes from icon or frescoes of Archangel Michael (one of the four grand angels in Islam) painted in the dome, in front of the main apse. There is an apple figure in the hands of him which is the reason that it is called as apple. 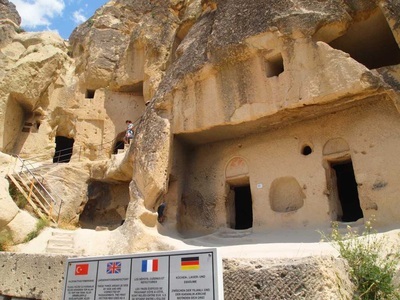 Situated on the entrance of museum, well known Nunnery has 7 storeyed rock building. In first and second floor composes of kitchen, dining hall and some rooms. The third storey which has cruciated planned, four columns, a dome and three splendid apses is very important section because it includes a secret tunnel. Actually every floor was connected with each other.